Kyle Bennett had already left the Fratton faithful drooling during an inspirational Pompey debut. Dagenham & Redbridge had been ruthlessly dispatched by the swaggering hosts, their left-winger conjuring up an assist and two goals. Yet Paul Cook’s new arrival at right-back also caught the eye. Ben Davies, the triallist signed 48 hours ahead of last season’s curtain-raiser, made a favourable impression which would not diminish over the course of the campaign. With the Blues leading 3-0 and the match entering its final throes, the veteran hurtled up the pitch to close down Daggers keeper Mark Cousins. The comfortable kick was transformed into a hurried hack into the stands, earning Cook’s side a throw-in – and the platform for another attack. Such moments may appear trivial, yet the subsequent ovation from Pompey folllowers demonstrated recognition of that Davies contribution. A fans’ favourite was born. With trademark swashbuckling charges down the right flank, he became an integral part of reaching the play-offs. Those consistently-committed displays deservedly earned him an armful of player-of-the-season awards from supporter groups. Davies also finished runner-up to close friend and fellow golden oldie Michael Doyle in The News/Sports Mail player-of-the-season vote. Yet it now appears his time at Fratton Park has drawn to a close. The inability to agree terms on a new contract has dragged on for too long – time for both parties to look elsewhere. Potential Davies suitors supposedly include Wrexham and Grimsby, although his destination is irrelevant. He is off. At the age of 35, the right-back was keen for a two-year deal and a pay rise to reflect an importance to the side which consisted of 51 starts. One of the lowest-paid members of Pompey’s first-team, he could comfortably back up his argument for improved wage terms. Crucially, Cook was eager to keep him. However, since December there has been a struggle to find financial common ground. So that is it, farewell, set for a Fratton Park departure with both sides enduring heavy hearts. In recent times, few Pompey players have attracted such affection. Even fewer have been released on a free transfer. Supporters have savoured his battling displays, whole-hearted performances, tireless disposition and, of course, talent. A considerable class above recent right-backs Yassin Moutaouakil, Daniel Alfei, Adam Webster, Joe Devera, Alex Wynter, Josh Passley and Danny East. Last season only Bennett and Enda Stevens weighed in with more assists, while defensively scarcely any opponent has had the better. A model pro, immensely popular among his team-mates and the dressing-room prankster, Davies is softly-spoken yet armed with a mischievious smile. 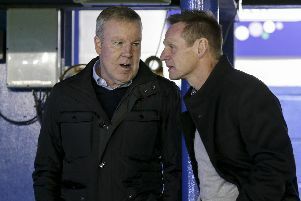 Fittingly, a final outing consisted of shrugging off concussion in his attempts to help Pompey reach the play-off final. Ben Davies will be a hard act to follow.